The title may lead you to think that I am comparing my work to my blogging but I am most definitely not, this is a fight. You see, I am one of those people who love their job. I chose to become a translator when I was 13 (until then I wanted to be a psychologist, I was a bit of a serious child, the sarcasm didn't hit until later) I loved writing and I loved English so when I realised there was such a thing as a career in translation I geared the rest of my teenage years towards that. Just in case you didn’t gather that from the name of this blog yet: I am a determined Spaniard! Translation was a way of disguising my love for writing behind my shyness and be able to write without actually writing thanks to the invisibility of the translator. 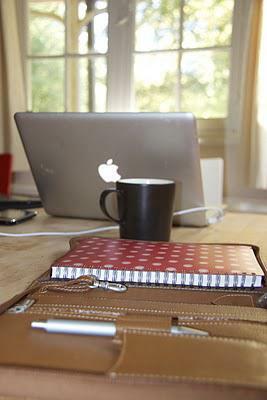 My tools: notebook, laptop and good old coffee! In the last couple of months I have found out just how much I love blogging and it’s not just because of being able to write, even if still hiding behind a pseudonym, it’s because of the community I have found, a group of supportive, witty, talented people. Work has been very busy lately (I always say busy is good when you are a freelancer) but it has been preventing me from writing all those blog posts that have been flying round my head and onto a notebook. There is a series of articles in particular that I am so excited about but that, precisely because of that and of what they involve, I want to get just right. Perhaps I should stop being such a perfectionist but then again that is what has built my reputation as a translator, I am well-known for being very professional and rather thorough. So there you have it, my work is fighting against my blogging and vice versa because they will always prevent each other from happening, perhaps I should just find a way around that. Thinking cap is on.